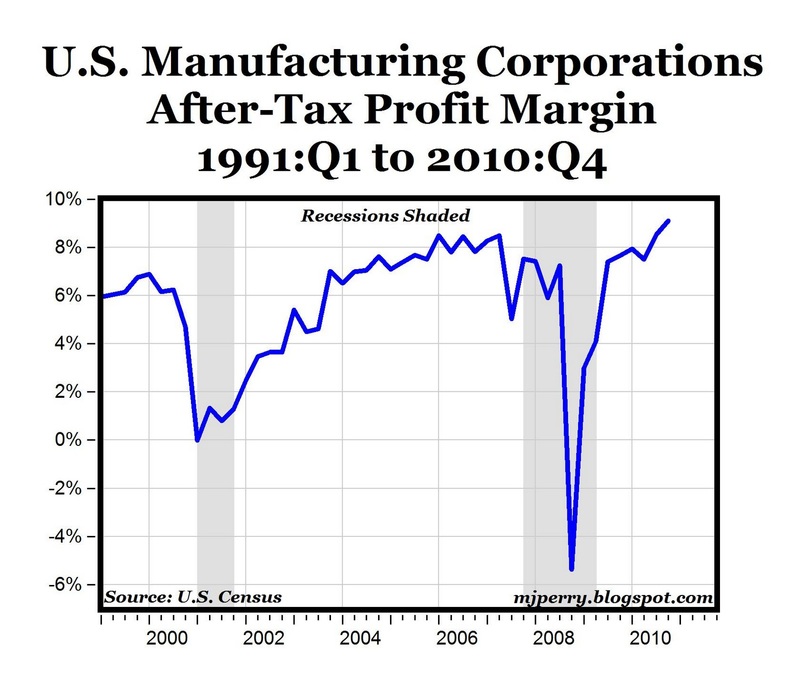 Both after-tax profits and after-tax profit margins (profits/sales) for U.S. manufacturing corporations soared to record-high levels in the fourth quarter of 2010, according to data released today by the U.S. Census Bureau. Profits for U.S. manufacturing firms reached $135.3 billion in QIV last year, the highest amount of profits ever recorded in a single quarter for America's manufacturers, and surpassing the previous record of $127 billion in QII 2007 before the recession started (see top chart above). 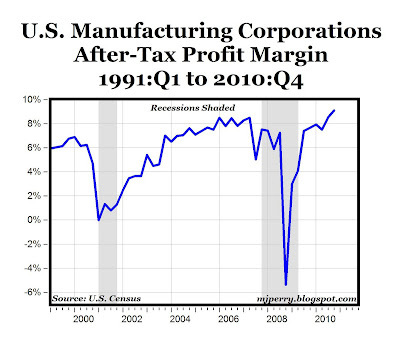 The after-tax profit margin for U.S. manufacturers also reached an all-time time of 9.1%, at least for the data the Census Bureau has available going back to 1999 (see bottom chart above). The surge of manufacturing profits in 2010 to record high levels provides additional evidence that the U.S. manufacturing sector is expanding, profitable, thriving and healthy, and is leading the U.S. economic recovery. Uh, okay. I guess if were the Federal Reserve chairman and cut rates to zero, weakened the US Dollar and flooded the economy with electronically created money I could get US manufacturing to do a few tricks, too. So what? Our problems started with over-leveraged housing, high commodity prices and joblessness. Our problems are still over-leveraged housing, high commodity prices (inflation) and joblessness. And I guess to follow up to that I can say, "congratulations America. We've created a bunch of crap." Only problem is we're a debt and consumption-driven economy. Well isn't that just special. Pardon me while I do a "happy dance." Actually, I WOULD be impressed if they actually PAID taxes. However, since ALL American Corporations only paid $35.9 B in Taxes over that period, I guess I'll save my celebration for the bankruptcy party. 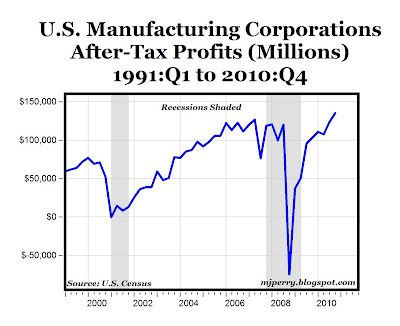 Le'ssee, Corporate Profits are running at about a $1.7 TRILLION/Yr rate, right? And, Corporations are on schedule to pay, maybe, $0.1 T, right? I can see we're going to need more champagne. US exports are booming; for the first time in, oh, say 70 years, the dollar is not overvalued. Finally! Yes, many nations are still "cheating" ala China, and my favorite nation, Thailand. Still, we could see an epic export surge in the next 10 years, if only we keep the dollar in the current fair trading range. China should float its currency, flood the world with yuan, and become the new global engine of economic growth. Oh, wait. I forgot. They're going to pay dividends to Warren Buffet, and his buds. And, they're going to pay a whopping 15%. "Exports" booming? Yeah, Bubba. So much that we had a $46.3 Billion Trade Deficit in January. Looks like we'll easily do another -$500 Billion Trade Balance this year. Nothing like "Boom Times," eh? We're at $1.40 to the Euro, and half their countries have one foot in receivership? And you're worried that the Dollar may strengthen? I think you're safe. Rufus II says: "Actually, I WOULD be impressed if they (corporations) actually PAID taxes." "The average Joe should be in favor of lower corporate taxes," says Hodge, "because ultimately they are paying the corporate income tax. Either as workers, getting lower wages and fewer jobs, or as consumers, paying higher prices, or as retirees, getting lower dividends and earnings on their investments." Nonsense. I employed people; I still had to pay taxes. Everyone has to pay their share. otherwise, we Will, really, and truly, go over that cliff. Those corporations use the public roads. They are protected by the Police, and Fire Departments. They are able to "do business" in the U.S., and around the world as a result of the U.S. Navy, Army, Air Force, Marines, and Coast Guard. Everyone "creates jobs." When I go to the grocery store I "create jobs." That doesn't mean I can quit paying taxes. You want to live in a country where the richest pay 15%, and the corporations pay 5.9? Try Mexico. Maybe you'll love it. But, you can't run the U.S. on less than 21% from the richest. The rich either have to "pony up," or we'll just have to downgrade our country. There is no other way. Personally, I'd rather "pony up." The water down there gives me the runs. Rufus II, don't worry, you'll be paying your fair share of taxes, one way or another. Government will make sure of it. Of course, you may have to flee to Mexico, because you'll no longer be able to afford to live in the U.S.
We need pro-growth policies that will reduce the unemployment rate faster. So, the economy can expand faster to raise tax revenues and lower unemployment benefits, which will help shrink budget deficits. We need to cut hundreds of billions of dollars in government spending and use every dollar for tax cuts, and deregulate to stimulate growth. Federal spending 2007: $2.73 trillion. Federal revenue 2007: $2.57 trillion. Budget deficit 2007: $161 billion. Federal spending 2011: $3.82 trillion. Budget deficit 2011: $1.65 trillion. 1. Offshoring low profitable goods for higher profits, importing those goods at lower prices, and freeing-up limited resources to raise domestic production of more profitable "core" goods and facilitate growth in emerging industries. 2. An overabundance of cheap domestic labor (e.g. $10 an hour), including immigrants from poor countries. "The rich either have to "pony up," or we'll just have to downgrade our country. There is no other way." Who, exactly, are these "rich"? The top 10% of earners in the US already pay 70% of the income taxes. Do you really think they should be asked for more? "Personally, I'd rather "pony up." The water down there gives me the runs." Does that mean you are one of those "rich"? I don't understand what you mean here. "Actually, I WOULD be impressed if they actually PAID taxes." Rufus, where do you think companies get the money they use to pay taxes? Rufus II says "The rich...have to "pony up" (corporate income taxes)." The overall effective federal tax rate (the ratio of federal taxes to household income) was 20.7% in 2006. Individual income taxes, the largest component, were 9.1% of household income. Payroll taxes were the next largest source, with an effective tax rate of 7.5%. Corporate income taxes and excise taxes were smaller, with effective tax rates of 3.4% and 0.7%. This analysis shows that the overall increase in revenues as a share of gross domestic product (GDP) since 2003 is disproportionately accounted for by increases in corporate income tax revenues. Total federal revenues grew by about $625 billion, or 35 percent, between fiscal year 2003 and fiscal year 2006. Receipts as a share of GDP rose from 16.5 percent in 2003 to 18.4 percent in 2006, an increase of 1.9 percentage points. Revenues from corporate income taxes rose from 1.2 percent of GDP in 2003 (their lowest level since 1983) to 2.7 percent in 2006 (their highest level since 1978). That increase of 1.5 percentage points of GDP in corporate income tax revenues accounts for the bulk of the overall 1.9 percentage point rise in revenues. you are looking this the wrong way and using the wrong numbers. first off, corporate tax receipts go up markedly in % terms as the year goes on as their profits move them into higher brackets. most corporations are very small. your corner grocery does not pay a ton of taxes because it does not make a ton of money. further, wages are a significant expense and those will also be taxed. you are also leaving out the effect of the NOLs carried forward from the last several years when many lost money. you also seem to be using the wrong numbers in your calculations. even the piece you cite predicts 280bn in corporate receipts for the year. 280bn/1680bn = 16.7% tax rate, around 3 times what you are claiming. receipts in December alone were $43.4bn (annualizing to 516bn). estimates for the year are 280.4bn. does that really seem low to you? i grant that there are folks like GE who are just federal welfare babies and whose gravy train needs to be shut off, but by and large US corporations pay much higher taxes than US citizens and much higher taxes than in any other OECD nation. note that they also pay half of their employees FICA which likely pushes their effective tax rates into the 20's. i think you are barking up the wrong tree here. the facts simply do not bear out what you are claiming. No, Morgan. I'm looking at "receipts;" you're looking at "estimates" that have NO Chance of being realized. I went back and looked at the same point in 2006, and Corporate Taxes were running 3 times what they are now. And, that, from lower profits. No, Morgan; we have, essentially, allowed a "Tariff" to be imposed on products Made in America. We will be in Recession in December. BTW, I called the "Present" recession in July of 2007. "You want to live in a country where the richest pay 15%, and the corporations pay 5.9? Try Mexico." No. I want to live in a country without a corporate income tax. Confiscating money from corporations and giving it to the corrupt political hacks in Washington, D.C. will not result in increased economic activity and more jobs. Taxing corporations is like eating your seed corn. How long will it take idiots like you to figure this out? What's more, most of the corruption in D.C. is driven by corporations trying to influence the tax code. The corporate tax code is simply an extortion racket run by our political class. Tax individual compensation at the flattest, fairest rate and leave corporations with the capital they acquired to expand their legitimate, profit making enterprise. And, by the way, Mexico's problems run much deeper than their tax code, genius. "... you can't run the U.S. on less than 21% from the richest." Says who? We may as well say that we can't run it on less than 100% from you. So, either "pony up," or we'll just have to downgrade our country. $38 Billion Collected from Corporations in the first FIVE MONTHS! This should translate out to about $150 B for the fiscal year. Maybe, 8%. You can run "Mexico" on these kinds of revenues; you can't run the United States on them. "I went back and looked at the same point in 2006, and Corporate Taxes were running 3 times what they are now. And, that, from lower profits." you are missing the fact that this is not a one period equation. net operating losses in 2008-9 were very significant. this will drop corporate tax rates while they are worked off. that's going to hold 2010 tax receipts down. the rates have not changed on corp tax since 1993.
you are mistaking the business cycle for low taxes. go look at what happened to tax rates after 1982 and you'll see this same pattern. you also make the claim that 280bn has "NO chance of being realized". perhaps you could provide some support for that conjecture? also: we are still in recession now. there is no recession to fall back into. the only reason we think we are not is that inflation is being so understated. If corporations get all of their money from the consumers of their goods and services, who really pays corporate taxes? Shouldn't those taxes be as close to zero as possible? 38bn in 5 months is not a number you can linerarize. actual receipts come predominantly in the back half of the year once overgheads are covered etc and the profits increase into new marginal brackets. i month december receipts were over $43 bn last year. have you ever actually run a company? you do not seem to understand how corporate taxes are actually paid. there is no "corporate withholding". Morgan, who said anything about withholding? Yes, I have run businesses. The full year corporate tax receipts should come in between 3, and 4 times the "five month" mark. That would put us in the $150 B range. You'll notice they changed (lowered) their estimate between Jan, and March. BTW, corporate tax receipts are running BELOW fiscal year 2010. This is all a result of crazy tax laws forcing any sentient CEO to keep his money (and, consequently, most of his investment) overseas. Che, you could make the same argument about "sales" taxes, or, actually Any taxes. The fact is: taxes should be as low as possible; but they Have to be high enough to "get the job done." If you're going to spend a couple hundred billion/yr in the Mideast, protecting the oilfields, and keeping the Straits of Hormuz open you're going to have to have high enough taxes to pay for it. Corporate taxes come from the consumers, the workers, and the stockholders. Corporate taxes are a source of revenue that politicans can milk without losing votes from uniformed voters because it comes from the "bad guys". We tend to demonize others to make ourselves feel better instead of addressing the real problems. Sixty Minutes had a report on corporate taxes last Sunday. Does anyone find it surprising that corporations leave the U.S. and its 35% corporate tax for places such as Switzerland and Ireland's 10-20% corporate tax rate? I don't. personal income was 13.4tn in 2008.
corporate profits were about 10% of that at $1.36 tn. 45% of federal income was individual taxes. 12% was corporate. corporations are paying a much higher effective income tax rate than individuals. they pay 27% of the amount individuals pay on 10% of the income. you are just trying to linearize a bunch of non linear trends. looked at on a full year basis, corporations are taxed MUCH more highly than individuals. 12% of 2.5tn in government receipts = 300bn. your 5-6% number is simply not reflective of any sort of full year reality. you seem to be off by multiples. you will also note that there are a whole bunch of stimulus programs and tax cuts this year. corp tax receipts will disproportionately reflect this in the front half. all tax receipts are way down. i'm not defending the tax structure, i think it's insane, overcomplicated, and full of sweetheart giveaways to both individuals and corporations. i'm a big proponent of a flat tax. but there is really no evidence to support the assertion that corp taxes are low in the US. they are very high relative to personal taxes and the highest in the OECD. the issue in the US is not that our taxes are low, it's that our spending is wildly out of hand and our entitlement programs are running amok and will sink us if not reined in. "Does anyone find it surprising that corporations leave the U.S. and its 35% corporate tax for places such as Switzerland and Ireland's 10-20% corporate tax rate? I don't." for once, i find myself in complete agreement with you walt. the current system makes running a company in the US very unattractive in relation to much of the rest of the world. hell, just living here is very unattractive if you are wealthy. i am taxed on global investment income. if i lived in canada and invested in switzerland, i would not be. many of those in my profession have been acquiring dual citizenship (myself included). i don't want to leave the US, but there is a price at which i will. corporations face an even more substantial incentive to do this. their managements are legally required to maximize shareholder value. they could be accused of fiduciary misconduct for NOT offshoring. the answer to this is to cut corporate taxes, not extend them overseas in a more draconian fashion. that will just cause whole companies to leave the US instead of subsidiaries. "This is all a result of crazy tax laws forcing any sentient CEO to keep his money (and, consequently, most of his investment) overseas." Wait a minute. If this is true, how can you justify calling for higher tax collections from corporations, unless driving capital and businesses overseas is desirable, in your view? Please select one position and stick with it so people can know how to respond. For once, perhaps the first time ever, I agree with your entire comment 100%. Holy Mackerel, Morgan; your footwork would make Bojangles blush. The fact is: To Date, American Corporations have made approx. $700 Billion in Profits, and have paid $38 B in Taxes. You can dance until the cows come home, but "Them is the Facts." Of the projected $1,700,000,000,000.00 in Profits they will pay Less than 10% in Federal Income Taxes. That, also, is a pretty much foregone conclusion. All the rest is misdirection. "... you could make the same argument about "sales" taxes, or, actually Any taxes." Taxing an individual is not as damaging as taxing a business using it's capital to improve and expand, creating economic opportunity in the process. Get rid of corporate taxes and businesses will expand. Others will flock to the U.S. bringing jobs, economic growth and increased individual tax receipts with them. "Of the projected $1,700,000,000,000.00 in Profits they will pay Less than 10% in Federal Income Taxes. That, also, is a pretty much foregone conclusion." oh, so now you suddenly have projections you believe? now who's dancing like bojangles? you are again trying to linearize something that is not linear. it is not i who am dancing, it's you who are using faulty calculation. find me any full year in which the tax rates you describe have occurred. YTD corp tax receipts are only down 6% vs the same period last year. that would not drive anything like the drop you are describing on the full year. you keep repeating the same flawed calculation over and over as though that demonstrates something. corporations have paid 2-3X the tax rates of individuals in every full year for decades. you can dance around that as much as you like, but the facts are the facts. US corporate tax rates )and receipts) are the highest in the developed world. so sure, there are a couple of federal welfare babies like GE, but by and large, these companies are paying A LOT of tax. i would be willing to bet you that the average tax rate in the fortune 500 is north of 25%, more than 3 times the average personal tax rate. "Taxing an individual is not as damaging as taxing a business using it's capital to improve and expand, creating economic opportunity in the process"
this effect is greatly amplified by the fact that corporations are much more able to move offshore than individuals. there is also likely a feedback effect. personal income is highly linked to corporate profits. that drives expansion and job creation which, in turn, drives personal income. After 5 months they had paid in $45.437 B. So, they ended up paying about 4 times their first 5 months contribution. Like I said. Morgan, show me where those Corps actually paid that money. Betcha can't. "Corporate taxes are a source of revenue that politicans can milk without losing votes from uniformed voters because it comes from the "bad guys". We tend to demonize others to make ourselves feel better instead of addressing the real problems." The AFL-CIO loves to beat this drum as well. I say we eliminate the corporate income tax, now a minor revenue sourc for the federal government, and replace it with a gasoline tax. Why sure, Benji; why don't we just make it illegal to tax "Anyone" with an income over, say, a Million Dollars/Yr. Just put it ALL on the poor people. Is there anyone, here, that DOESN'T have Brain Cancer? "Just put it ALL on the poor people." How about just some of it? Right now the bottom 40% pay no income taxes. Everyone should have to share the burden of paying for all these failed liberal programs. "Morgan, show me where those Corps actually paid that money. Betcha can't." this is a stupid challenge. tax filings of corporations are private. plug in the symbols and do the math yourself or are you claiming that all these companies lied in their 10k's? the average tax rate for S+P 500 companies over the last 5 years has been north of 32%. that 16% comes from the feb numbers as opposed to the dec to which you initially linked. note that in the dec numbers, receipts were UP 6% from a year ago. also note that the beginning of this year will show a drop in tax receipts due to the new tax codes. if you have overpaid, then you pay NOTHING until you catch up. show me any full year where the corp tax rate has been even twice what you are describing? seriously, one year under 10%. and just where do you think jobs and personal income come from? mostly corporations. leave them with more money and they will invest more, grow more, and hire more. yes, what a tragedy for the people that would be. taking money away from the productive to give it to the unproductive is NOT a recipe for long term prosperity. i think benji's gas tax idea is a bad idea, but cutting corporate taxes increases personal tax receipts by decreasing unemployment and increasing productivity and salaries. this tends to balance out over time (though there is an adjustment period). in the long run, tax income will be higher as growth will be higher. prosperity comes from making the pie bigger, not from reapportioning the slices. "Why sure, Benji; why don't we just make it illegal to tax "Anyone" with an income over, say, a Million Dollars/Yr. Just put it ALL on the poor people." You may be onto something. That's not a bad idea. As people with high incomes have shown that they are the most productive members of society, and produce the most benefit for all of us, they should be taxed the least, so their resources can continue to be used productively, rather than used inefficiently by government. The poor, on the other hand, have shown their inability or unwillingness to contribute their fair share to the benefit of others, so should be taxed more heavily. Morgan, that $191 B (or less) last year would have been about 12% - a far cry from the numbers you're giving. Show me where Exxon paid 32% of its profits in U.S. Income Taxes last year. Hint: The last time I looked they hadn't written a check to the U.S. Treasury in years. Congratulations, Ron. You win the kewpie. It took a while this time, but the scenario held. If you scratch the Carpe Diem reader often enough you will eventually uncover a Feudalist. The Serf retires from the field. The Manor is safe. "It took a while this time, but the scenario held. If you scratch the Carpe Diem reader often enough you will eventually uncover a Feudalist." I'm disappointed. Is that your intent? Are you just trolling here? I thought you might have something important to contribute to the conversation, but maybe I was wrong. I post links to Federal Tax Receipts; and you propose eliminating taxes on the rich, and raising them on the poor. I'm on Candid Camera, right? "I post links to Federal Tax Receipts; and you propose eliminating taxes on the rich, and raising them on the poor." Gee, I thought my idea made more sense than your suggestion that the rich should pay more, that they should "pony up" as you put it. After all, the rich paying more taxes means they can't use their money to produce more wealth, something they've proven they are good at. Do you think government can make better use of the money than the people who earned it? Actually, I am somewhat aghast at the growing plutocratic trends in the USA. The rich do not serve in war, and do not want to pay taxes--other than that, they are real patriots. That said, complexity in the tax code is inherently unfair, and taxing productive behavior (corporations) vs. gasoline consumption is for me an easy choice. Yes, Morgan Frank, in a perfect world there would be no taxes; in a perfect world we would have zero military outlays. Taxing gasoline makes peerless sense, for reasons of environment and national security. Both national security and environmental costs are not captured by the free market price signal. Taxes on gasoline would make the free market work better. PS I am still waiting for the names of three publicly held companies in China in which the majority of voting shares is not controlled by the CCP, or CCP-controlled entities, such as Chinese regional governments. Why would anyone believe the Census Bureau today? "... why don't we just make it illegal to tax "Anyone" with an income over, say, a Million Dollars/Yr. Just put it ALL on the poor people." First, poor people do not pay income taxes, they receive the benefits of them. So, we've already put it ALL on the rich people. Second, no one is saying that you cannot tax INDIVIDUAL income only that taxing corporations stifles economic growth and investment. Corporate taxation also feeds political corruption. Explain how taking money from a corporation and giving to the politicians in D.C. results in increased economic activity and job growth. Wasn't squandering a TRILLION dollars of our children's money enough to prove the lie behind that proposition? "The rich do not serve in war, and do not want to pay taxes--other than that, they are real patriots." Complete gibberish. Having read your posts, you are the very last person who should be questioning someone else's patriotism. "Every income category above $40,000 per year is overrepresented in the active-duty enlisted force, while every income category below $40,000 a year is underrepresented. Low-income families are significantly underrepresented in the military. U.S. military enlistees disproportionately come from upper-middle-class families." Who Serves In The U.S. Military? "PS I am still waiting for the names of three publicly held companies in China in which the majority of voting shares is not controlled by the CCP, or CCP-controlled entities, such as Chinese regional governments." And I'm still waiting to find out if you're disappointed your boyfriend and the Democrats reject the GOP's "extremist" budget cuts. Now run away again, little girl. ...And I'm waiting for information on tax receipts from those paying the top tax rate of 91% during the 1960s. "Show me where Exxon paid 32% of its profits in U.S. Income Taxes last year. Hint: The last time I looked they hadn't written a check to the U.S. Treasury in years." looked where rufus? you sound like you are making stuff up and reading nonsense blogs. "Mind you, not all global megacorps enjoy such low tax rates. Try to muster some pity for Big Oil. ExxonMobil ( XOM - news - people ) in its 2009 annual report to the SEC, recorded a larger income tax expense than any other U.S. company last year, some $17.6 billion, or 47% of pretax earnings. Exxon's peers Chevron ( CVX - news - people ) and ConocoPhillips ( COP - news - people ) likewise recorded similarly high effective tax rates. The oil companies are oddities among the multinationals because many of the oil-rich countries where they do business levy even higher taxes than the U.S."
i already showed you their SEC filings. are you claiming that they are lying? the cash flow statements back it up. so where's your evidence? do you seriously think that the SEC and IRS don't talk? i think your math is bad on your 12% number. that implies a 1.6tn profits number. where did you get that? i think you are annualizing q3 or looking at CY 2010.
you don't pay taxes on annualized earnings, you pay them on trailing. the tax rate was 21% even in q1 2009 and 21.5% in q3 2009.
i am trying to figure out if you are being deliberately manipulative with your improper use of these numbers or if you are just incapable of basic algebra and making sure your units match. why don't you show us your numbers so we can tell for sure? you cannot evaluate this as a one period model. what happened in the prior period matters a great deal. many firms lost money in 2008-9. that produces NOL's and depresses the tax rate in the following period. therefore, one would expect a lower tax rate in 2010, but it's still much higher that the 12% number you claim. this means they pay no taxes. all profits are passed through to shareholders and taxed as individual income. for a company paying out large dividends, this is a preferable structure as it avoid the double taxation of corporate profits being taxed, and then dividend payments being taxed as individual income. Milton Friedman Schools A Young "Michael Moore"
Where Are the Female Economics Bloggers?